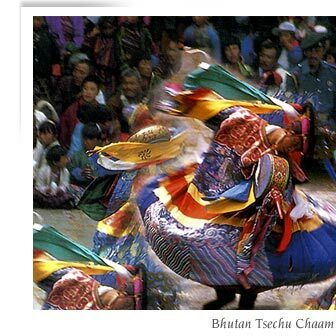 At various times of the year, Bhutanese in towns and villages congregate to witness the masked dance festivals known as tsechus. These colorful events draw thousands of locals, some of whom walk for days in order to attend. While the underlying purpose is spiritual, dances are more often like plays where good triumphs over evil or depict significant historical events, especially surrounding the life of Bhutan 's patron saint, Padmasambhava (also known as guru Rinpoche). There is inevitably a great deal of socializing. it is an opportunity for people to relax and forget the daily routine, to dress in their finest clothes and jewelry but, more importantly, it is an occasion for prayer and blessings. Tsechus mainly comprise of mask dances in addition to some folk dance entertainment in between. Festivals are not pageants or entertainment events and definitely not held as tourists attraction. They are genuine manifestations of religious traditions thousands of years old, which outsiders are given the privilege to attend. Please re-confirm prior to booking your trip.